I’m a big believer in the mantra “dress for success.” And, although it’s not yet scientifically proven, I am pretty positive that you will always feel more confident and secure if you are dressed in a crisp, clean and appropriate outfit. This especially rings true for job and internship interviews. As the internship coordinator at Clairemont, I’ve seen plenty of interview candidates – and often been one myself in the (somewhat) recent past. For an interviewer, few things are more distracting than an inappropriately dressed or sloppy candidate. 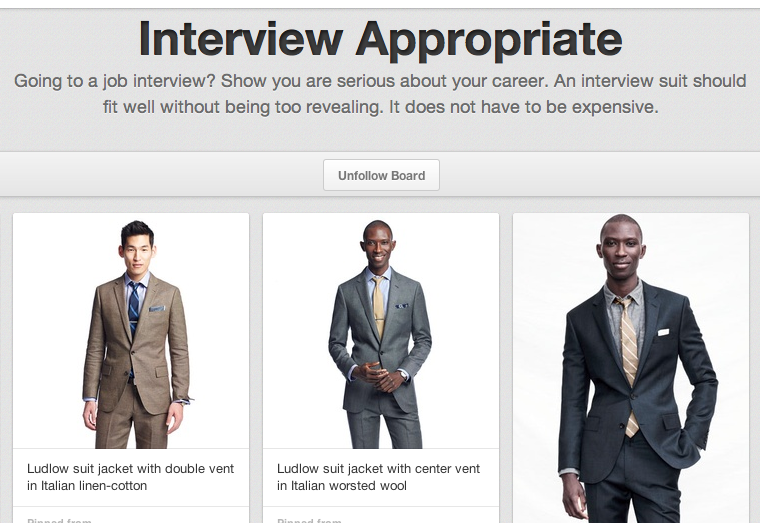 For a job hunter, dressing the part for an interview can be just as stressful. Is this too dressy? Is this too casual? Is this too boring? As a college student seeking internships and jobs, I often asked myself these questions. From experience (on both sides of the interview table), this is what I have decided. Sporting a suit should always be your first choice. It doesn’t have to be expensive, but it should fit well without being too revealing. For women candidates, this can be a skirt or pant suit, or the alternative suiting dress, like this one from J.Crew. Suits are classic and classy and show you are serious about the job. For more inspiration, see our Interview Appropriate board on Pinterest. If a suit feels too stiff for the occasion, opt for a tailored pencil skirt or pair of slacks, a blouse and a cardigan or blazer. For a creative job in an agency setting, take the opportunity to show your individuality with statement accessories or a fashionable blazer like this one from Nordstrom. We also love this simple pencil dress with subtle leather detailing from Asos. What are your tips for dressing for an interview? ← Three Cheers/Barks for Pawgust First Friday!